For several years much hue and cry has been made by a small group of disgruntled law professors and a somewhat larger group of unemployed recent law school graduates about the allegedly “unsustainable” nature of the American law school. The pain that has motivated the concerns of the law school graduates is readily understandable. Many of them, no doubt most, are unemployed through no fault of their own. Just by virtue of the fact that they completed law school and passed the bar exam, it is clear that they are highly motivated, that they are hard working relative to most of their peers and that they are in a position to make a significant contribution to their community and wider society. It is less clear how one explains the aggressive demeanor of those few law professors who have turned on their colleagues, their institutions and their own careers in order to push for the widespread shut down of dozens of law schools. The behavior of some of them borders on the pathological. One indication of the true nature of the faculty critics is the fact that so few of them expressed any support for concrete proposals, such as debt relief linked to pro bono legal training and practice, that would have helped this lost generation of law school graduates. Instead they have seemed quite intent on simply exploiting those students’ condition to advance an ideological agenda. It may be difficult for many academics to recognize the inherent hostility that surrounding society has for the academic project and, because of the unusual role lawyers must play in a law bound nation, the particular hostility held by many towards lawyers. I spent a substantial amount of time in that “real world” prior to re-entering academia and came armed with a pretty good feel for this issue. It has two dimensions to it, including a general anti-intellectualism in American life (one recalls Richard Hofstadter’s famous work on this problem) and an inherent hostility to lawyers. Combine that problem with the free market agenda of some at places like Cato and Hoover to destroy tenure in education generally and you have a fairly toxic brew. While the personal motivations of these law faculty “critics” with respect to law school itself may be difficult to explain, the nature of their core argument is much easier to understand. They have been artful and persistent in contending that the real meaning of the recent downturn in legal employment is that the American law school is based on an “unsustainable” business model. Because of the surrounding macroeconomic crisis – which, like a one hundred year storm swept up everyone in its path – separating cause and effect with respect to this model has, in fact, been very difficult. The anecdotal data appeared to be very much on the side of the critics. After all, with even the most prestigious law firms laying off partners and the most prestigious law schools reporting difficulties for their graduates in the job market it was very hard to consider the possibility that what was happening was, in fact, the result of the inherently cyclical and volatile nature of modern capitalism. The result is that it is very likely the case that almost every law school dean in the country is enduring one of the most difficult summers they have ever experienced in their professional lives. While I cannot divine a solution to every one of the individual situations these deans and faculty are now facing, I can point to some important new research that should significantly ease their pain. A new paper, peer reviewed prior to its presentation to the 2013 American Law and Economics Conference at Vanderbilt, provides concrete data upon which to judge the sustainability of the law school model. The paper is authored by Frank McIntyre, a Stanford-trained labor economist and finance professor at Rutgers, and Michael Simkovic, a Harvard-trained empirical law and economics scholar who used to work at McKinsey and Davis Polk and is now on the faculty at Seton Hall. It is available here. 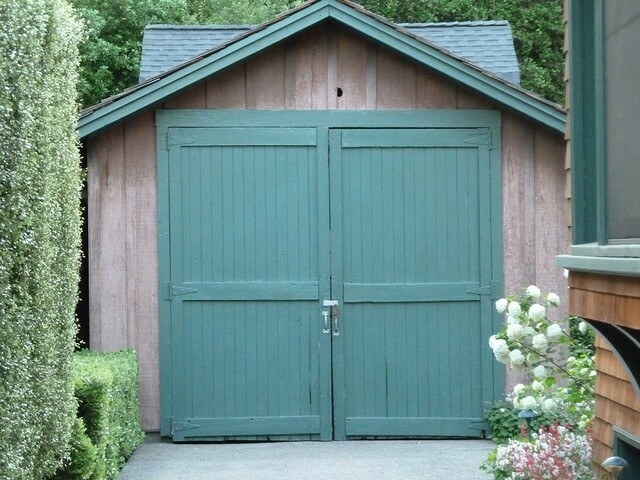 The very helpful power points can be accessed here. In addition to being peer reviewed upon submission to ALEC, the paper’s authors thank a wide range of well established scholars from several disciplines for their comments on the paper including Bernie Black at Northwestern Law, Eric Rasmusen at Indiana Business, and Ronald Ehrenberg at Cornell’s Industrial and Labor Relations School. The good news is that, yes, the recent crisis is cyclical not structural; yes, law school represents a worthwhile investment for a substantial majority of students who earn JDs; and, therefore, as a general matter, law schools and their university administrations should be very cautious about taking drastic action in response to the recent pressure created by the downturn in law school applications. 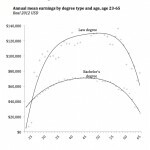 The reason one can draw these general conclusions is that through careful empirical work the authors are able to track the lifetime earnings premium that holders of JDs win over those students who hold only BA degrees. Their estimate is that at the mean this premium is worth $990,000 for JD holders and at the median is worth $610,000. These figures do not include taxes or tuition although they do include the cost of living incurred while attending law school. 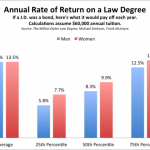 After deducting for tuition, however, it is the authors’ conclusion that “for most law school graduates, the net present value of a law typically exceeds its cost by hundreds of thousands of dollars.” Deducting taxes lowers that outcome, although it remains positive for most law students and, the authors argue, “may dramatically increase” at the lower end of the distribution with the availability of debt forgiveness or IBR type programs. Of course, an institution such as the American law school that can produce graduates who attain such a substantial financial advantage over their non-law school BA colleagues can easily maintain a sustainable business model. 2) the authors conclude and, in my view clearly demonstrate, that the recent difficulties for JD holders were generated by a cyclical downturn in the wider economy and not by some kind of unique event that hit the legal profession in a manner not experienced by every other profession; and perhaps of greater importance the study’s data clearly show this downturn is over now and the earnings premium of JD holders has now turned upward consistent with its behavior over many years and in spite of the ongoing, if short term, difficulties of recent JD holders (the data on earnings is carried through 2011 for all JDs who graduated from 1996 through 2008). What are the implications of these key results? Well, first, let’s put on the table what the results do not mean: they do not mean that law schools are not facing significant short term challenges. And as Keynes once quipped, in the long run we are all dead. The short term matters. And for schools facing enrollment challenges that short term is happening right now. And that is why it is important to read this paper, understand its conclusions and absorb its implications. But it is important to keep in mind that law schools are not, by a long shot, sinners in the recent events despite the strenuous efforts of the critics to convince people otherwise. Formal attempts to pin responsibility for the largest meltdown since the Great Depression on law school marketing materials have had very little success when faced with an open test in court (by my count, four such cases have been dismissed and two have survived an MTD). Less formally, the opportunistic behavior of the critics has led many JD holders to turn on law schools and law professors. This is consistent, interestingly, with the intuitive assessment of Nobel Prize winning economist Gary Becker, who noted in a recent debate about legal education with Judge Richard Posner that he is “optimistic that the demand for lawyers will pick up again once the American economy returns to long-term growth levels. The US remains a litigious society, and the number of laws and regulations to be litigated are increasing, not decreasing.” He also affirms the argument of the authors about the economic value generally of higher education. 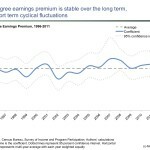 The authors are sceptical as well that anything has occurred in the last few years that suggests some kind of unique “neutron bomb” like event has hit the legal profession that did not also hit the rest of the economy. 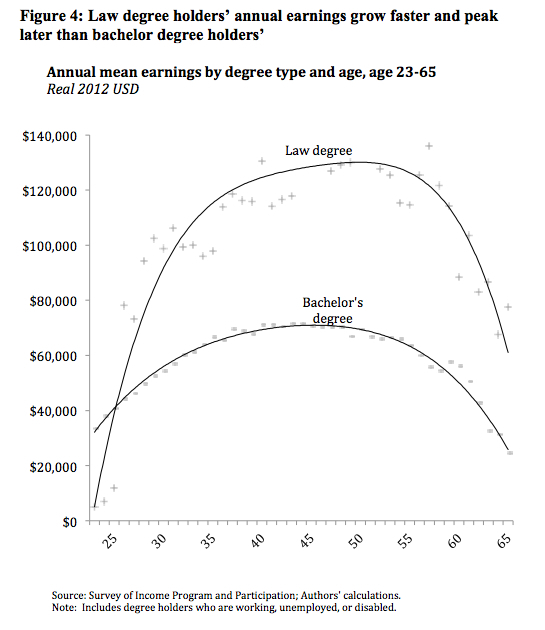 Thus, the relative significant advantage of a JD, across a wide range of income levels (i.e., for JD holders at both the 75th and 25th percentile of lifetime earnings – see chart below), persists. In short, for most JD holders law school has made sense for a very long time and it continues to make sense today. This means, of course, that for many law schools there are significant pressures with respect to enrollment. Schools that were too aggressive during the period prior to when the recent crisis took hold will be under pressure to meet their costs. That may mean some difficult conversations with University Provosts, Presidents and even Trustees. Thus, it is a good idea for law school faculty and deans to absorb fully the conclusions reached in the Simkovic/McIntyre paper. I recall when I was in law school during the downturn that followed the LBO/real estate crash of the early 1990’s that students were abuzz with the news that Latham & Watkins, then a law firm with about 400 lawyers, had laid off a handful of associates. Latham had prided itself on building up a public commitment that it would never lay off an associate because of the careful way they engaged in the hiring process. Yet, it happened. Students were understandably, then, leery for some time about Latham. (Not me, I should note, I sensed an opportunity and joined their firm in 1994. It was a terrific experience.) Today the firm is a global powerhouse with 2,000 attorneys, yet it took several years to regain that reputation halo. I think the process for a law school or university could be much more traumatic and longer lasting. Of course, this approach will be much easier to consider if the school and its university have been well managed over time, happen to be located in a booming area (like Silicon Valley), have had a balanced approach to expansion over the last decade and have a flexible culture. 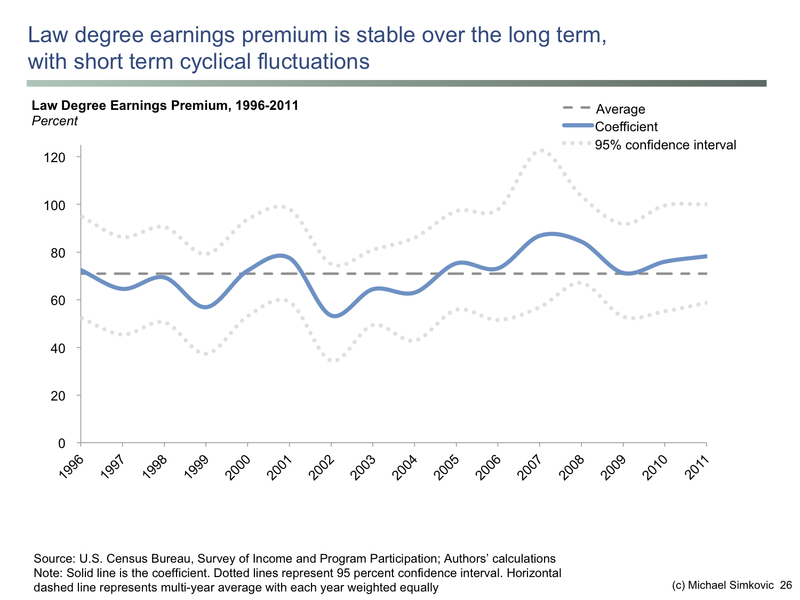 It also has to be kept in mind, for both students and universities, that while the Simkovic/McIntyre results confirm a significant positive earnings premium even at the lower end of the earnings level that at some point in the left tail of the distribution positive net present value will turn negative. It is possible, even arguable, that negative net present value results will be concentrated at certain schools. Those institutions will face unique pressures. Even worse, given the fact that we do not live in a collectively planned society, other higher ranked institutions may be tempted to cherry pick from lower ranked schools and thus a race to the bottom can take hold. 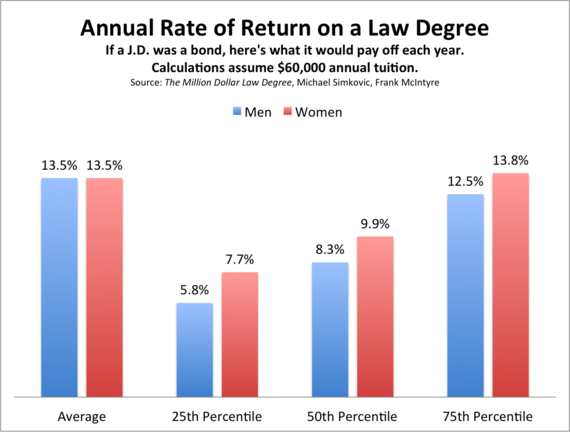 It is, thus, very fortunate that the American law school now has a data-based objective picture of the overall economic value of the JD project.